FANBOY PLANET.com . : mc-marvel-dome :. Two fans enter; one fan... oh, we just don't know. 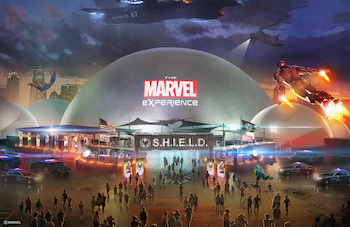 But it looks like Marvel plans to do more than just provide a traveling musical stunt show to arenas in the U.S. and Canada -- they're going to be bringing their own traveling arena in a completely different experience. ...a maze of connected domes will lead guests through an array of interactive games and original animated short films including the first-ever traveling motion-based ride. In short, a Marvel Carnival, more than six stories high. Designed to look like a S.H.I.E.L.D. mobile command center -- though totally given away by the Marvel branding -- it will cover more than 80,000 square feet, so likely to be appearing in the same places you'd see Cirque Du Soleil set up, or perhaps overtaking any local abandoned amusement parks, if you can get rid of the snooping mystery-solving kids. So... when and where? All that's been released so far is sometime this year, in the U.S. and Canada. But we'll be keeping an eye out for updates. With that promise of a motion-based ride, they could be beating their own Disney plans to the punch.